In the light and heat of the late afternoon sun, and as the air thickened with humidity, I wandered the streets of Panjim in Goa, India. At first glance, there was nothing but the faded beauty of better days which had passed. Looking closer, I saw that the vibrant colors of the crumbling façades had been made richer and more interesting by the patina of the passage of time and the shadows of their Portuguese past still lingered. Reds, ochres, teals, greys, and greens at every turn resembled a painter’s palette and I saw inspiration for creative projects yet to be born. As the day slipped into evening, I stepped out of the dust and haze of this old town and let the memories of colors from my stroll swirl and settle in my mind to forever become a part of me. Denise Spencer, an American living in Istanbul, is the founder of Ichiche—meaning ‘intertwined’ in Turkish—a line of clothing and accessories inspired by travels, faraway cultures and a bohemian chic lifestyle. The collection honors a strong belief in social consciousness and uses carefully sourced materials, handmade by independent seamstresses and craftspeople. 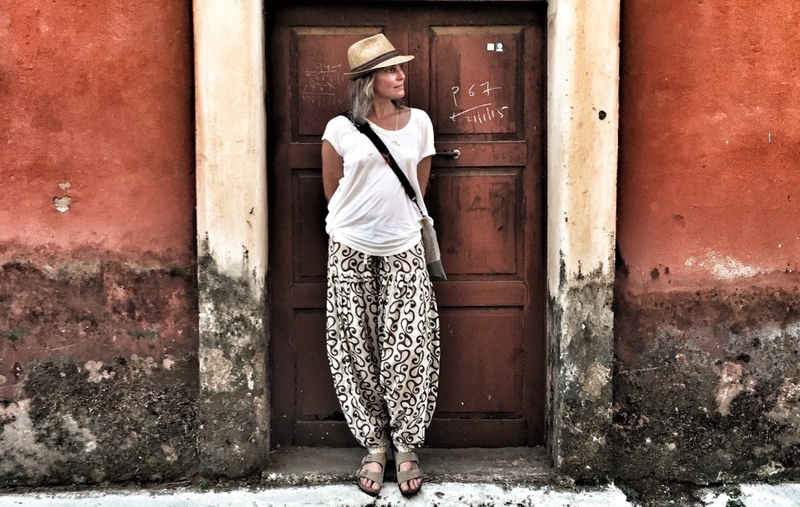 See more of Denise’s wanderlusting style on her Instagram @Ichiche.